Let this special time of year, or any special time of year, provide a little inspiration for your next article set! There is always another holiday or season right around the corner, so there are many opportunities to reach your readers throughout the year. Sprinkle a couple dozen seasonal articles into your inventory to generate sure-fire page-view spikes while you further define your niche and have a little fun in the process. 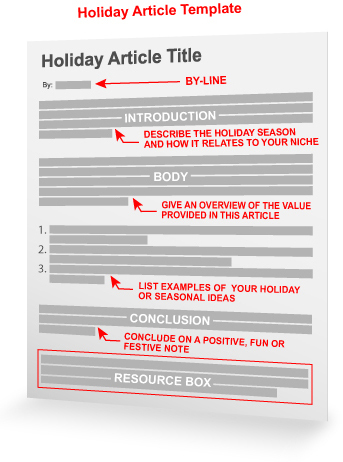 Select a Holiday, Season or “Day” (like St. Nick’s Day) – Find an angle that allows you to keep your content as “evergreen” as possible so your article maintains some value throughout the year. Introduction – Describe the holiday or season (perhaps give a BRIEF history if it’s appropriate) and how it relates to your niche. Body – In the next paragraph(s) of the article give an overview of the value provided in this article. Be sure to keep it within the context of your niche and the holiday or season you’re writing about. For example, tell them how your tips or ideas can make it more festive, cheaper, safer, easier or even flashier. List of Examples – Now give a list of examples of your great holiday or seasonal ideas. Expand on those ideas to add value to your article. If you’re talking about decorating on a budget – then give your readers places to get great deals in addition to ideas for decorating. Conclusion – Conclude on a positive, fun or festive note. No one wants to read a dour consequence in a holiday article. Make sure you end your article with why the reader should follow your ideas. A simple & effective template that works great for almost every niche. The holidays just wouldn’t be the holidays without the performance of certain rituals, like re-gifting Aunt Susie’s fruitcake, getting shameless at the office holiday party, or wearing a red and green sweater and the accompanying reindeer headband. 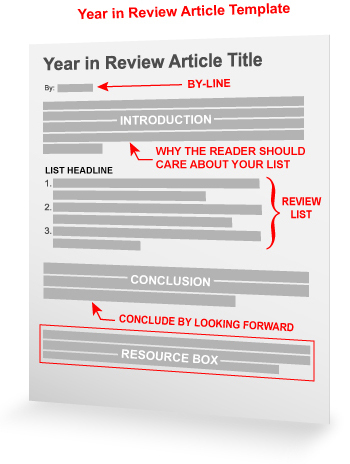 If you’re an Expert Author, you are almost obligated to sum up the year in article form. In fact, the ritual “year in review” list is so expected that you can be predictable and still get great reviews. For some reason readers love them – no matter how much they say otherwise. 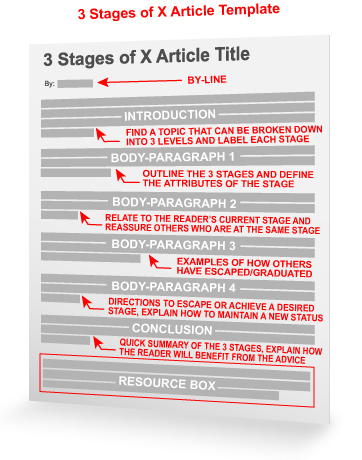 In fact, your real challenge with this article template is going to be deciding what to highlight first! Create a Benefit-Oriented Introduction – In your first paragraph, tell your reader why they should care about your list. What’s in it for them to keep reading? Pick Your List Items – Let’s say that you write about cooking. You could write a review on the top 5 chocolate recipes of 2009 or the 7 hottest (or most useless) kitchen gadgets introduced in the last year. Writing about a very specific area in your niche will allow you to later write many “review” articles in this topic area. Expand on Each Item in Your List – Each paragraph should be numbered and include a headline or highlighted title as well as a short summary of the item – i.e. the reason(s) why it made the list. Conclude by Looking Forward – In your conclusion, get the reader excited about the upcoming year by sharing what you expect to see happening in your niche in the next 12 months. Go ahead, make some predictions! Or challenge your readers to partake in one or more of the items you included on this year’s list. Having trouble picking which article template to use? These new icons can help! If you’re a fan of our article templates, you’re going to love our newest upgrade – Article Template Icons. These icons now accompany every article template in our blog inventory. Their purpose is to give you a quick visual synopsis of each template’s look and layout so that you might easily choose the most appropriate one for your next article. And from now on, you can expect every new article template to be accompanied by one of these icons. 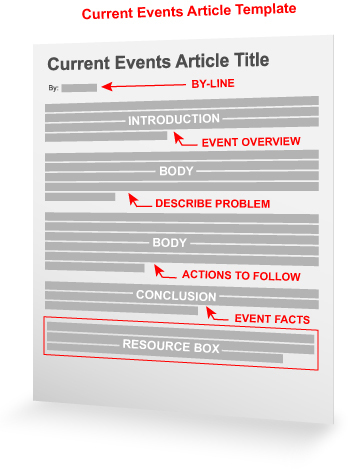 If you’re not currently using article templates, now might be a good time to start! Inspiration – Stuck for ideas? 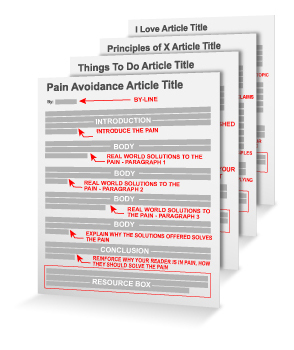 Browse through the article templates in the blog until one sparks an idea for your next set of articles. Speed – Rather than spending time on creating the proper structure for your articles, you can invest the time you save into writing new articles! Ease – These templates make it easy to build high-quality articles that are designed to inform readers while also driving traffic back to your website. 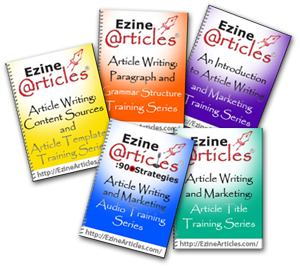 Style – Each of these templates is designed using the suggested EzineArticles layout and structure that insures an attractive, easy-to-read article that’s almost guaranteed to get results. 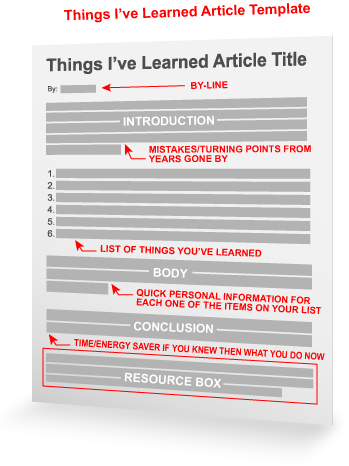 This simple and elegant article template takes advantage of something we all have … experience. Often, when we look back on our career, we don’t think of ourselves as knowing nearly as much as we do. If we sit back and really reflect on the years we have taken to get where we are now, we are surprised to see just how much we have been through, how many mistakes we have recovered from and just how much we know now that we didn’t know way back then. We know ourselves to be experts in our field, but how did we get there? How long did it take to accomplish what we have in our niche? This reflection begins a perfect article for your readers. 1. Illustrate your own path to expertise in your introduction. Include a humorous story of a mistake you made (that you found out later a lot of people in your field make) or show a turning point that helped motivate you and get you on your way. 2. Make a list. Type up a list (just for yourself to start) of all the things that you’ve learned through the years in your niche. Any axioms or truisms you can share? How about ways you’ve found to deal with challenging clients or get to the heart of a bureaucratic issue? 3. Cull the list down to the top 5 or 10 things you’ve learned. 4. Give a quick personal explanation for each one of the items on your list. You should share an anecdote or make up an example situation to better illustrate your point. Tell us how you learned this lesson…and what could have happened if you hadn’t learned it. 5. Conclude on an upbeat note. Tell your readers how much time and energy you would have saved had you known these things beforehand. Let them know how much faster they’ll get ahead if they listen to you. You’ve learned a lot on your road to becoming an expert. Share it by putting this template to good use! Having made mistakes is never a bad thing if you’ve learned from them – and you can help someone else avoid them, prosper and continue to look to you for guidance. Leave a comment and tell us about the experience you bring to your niche articles. 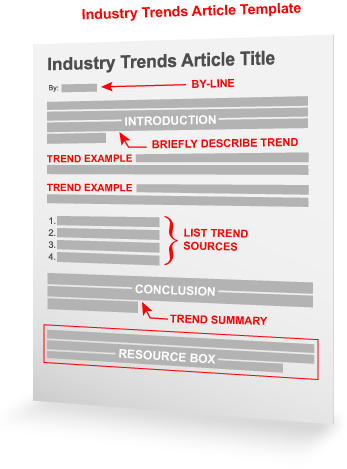 Jump start your writing and keep your readers “in the know” by identifying and writing about trends in your niche. 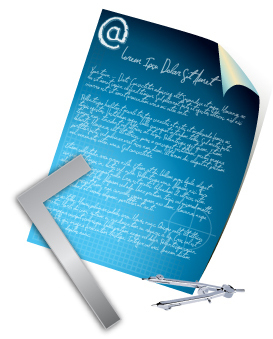 So, you feel like you’ve written everything there is to write on your niche? Let’s say you’re an expert on cars. You know everything there is to know about every car from the Model T to the Toyota Prius. You can tell anyone what is wrong with their car, just from listening to it. But you want to expand your writing repertoire beyond just writing about repairs. This is where finding and writing about industry trends comes in. In order to identify trends in your niche, you can’t just write what you know – you have to find out what other people know. What are other blogs and online magazines writing about? What’s popular in your industry? Going green? Families? Has a big automaker just come out with a new fuel cell car? If you write about travel, are there new ecologically-sound vacations families can take? This new article template takes advantage of news you can use. One of the best ways to get readers immediately interested in reading your articles is to tie them to a current event. The death of Michael Jackson, for example, spurred a flurry of articles tied to the speculation over how he died, his music, his legacy and how his death affected people. In two very different articles, one author used the death of Michael Jackson to show how to talk to children about death. If you write about psychology and related issues, this would have been a good topic to cover. On the other hand, one author in the exact same niche talked about throwing a Michael Jackson-themed party, which has nothing to do with psychology and related issues! A word of caution: Be sure that your article is written for your niche. Straying too far from your niche or forcing the link between your niche and the current event can confuse readers and alienate your followers. Only use this template when there is a clear, firm connection between the news event and your niche. Building an article around a news event is simple – and is very beneficial to your traffic, since keywords for breaking or celebrity news are highly indexed. 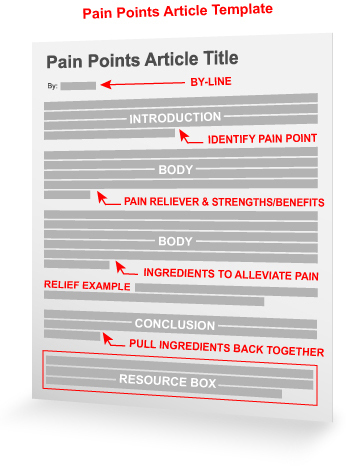 This new article template is the perfect cure for your ideal customer’s pain! What are some PAIN points that your ideal customers experience? What are some STRENGTHS/BENEFITS your company delivers to remove or prevent those pain points?